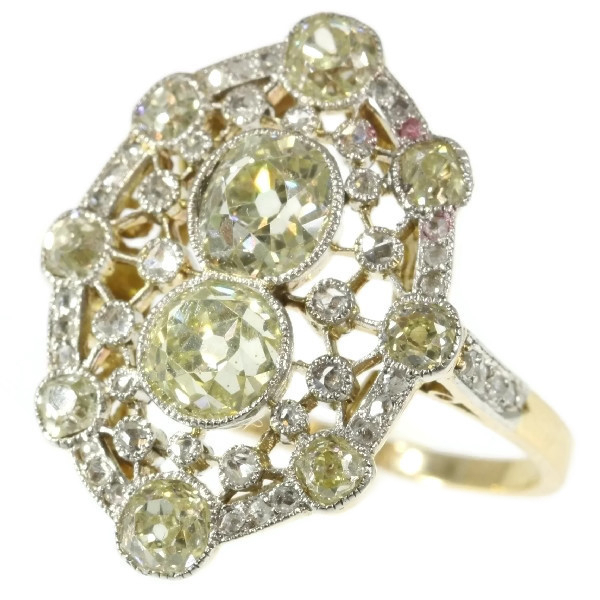 Très Belle Epoque diamond engagement ring with natural fancy color diamonds: Description by Adin Antique Jewelry. This Belle Époque 18K bi-coloured gold ring is a force of attraction just as strong as that of a black hole in space but with a lot more brilliance and shimmer. Two natural fancy yellow old brilliant cut diamonds with a mass of 1.20ct. are fusing together in the center of a constellation of 15 rose diamonds. With eight old brilliant cut diamonds alternating with more rose cut diamonds, it seems as if the boundary of this unique diamond universe keeps expanding all the way into the ring shank. When zooming in on the backside dimension with our telescope, we spot energetic sun swirls in yellow gold. It's hard to believe that this treasure is manmade, while it's got all these wonders of nature combined in one piece of jewellery. Diamond(s): Two old brilliant cut diamonds with an estimated weight of ± 1.20ct. Eight old brilliant cut diamonds with an estimated weight of ± 1.00ct. Total diamond count: 58 pcs. Total diamond weight: (without rose cuts) approx. 2.20 crt. with an average colour and clarity: K/Natural Fancy Yellow, vs/i.